Where is Esther mentioned in the Torah? In Devarim (31:18) it says, “And I will surely Hide (astir) My face on that day…” (Chullin 139b). At the time of the Purim story, there was nothing to see and no evidence… unless one looked, that is. Think of a father playing hide-and-seek with his little boy. The father counts to ten very s-l-o-w-l-y. The child runs about, unable to make up his mind where to conceal himself. Eventually, he hides behind the couch with his legs sticking out, giggling wildly. The father says, “Ten!” and immediately sees his son’s legs peeping out from behind the couch. The little boy’s giggles reach a crescendo and the father says loudly in a tone of feigned inspiration, “I wonder if he’s behind the couch?” and “Wow!” finds the child. Then, the roles reverse. The child counts as the father hides. Parents are better than small children at hiding and understand that you have to make sure your whole body is out of sight before the search begins. The father chooses a closet and quietly closes the door. “One, two, three, ten!” The son turns around and finds the room deserted. He begins his search, excited and laughing. He makes a beeline for… the couch! But Dad is not there. The little boy’s laughter falters and dies. Then inspiration returns and he bounds over to the window to look behind the curtain. Still no Dad. The child starts to despair. A sob escapes his quivering lips, followed by tears. The father hears the sob, knows what’s happening and finds that he simply can’t stop himself from sneezing the loudest sneeze in human history. The child bounds over to the source of the sneeze and pulls open the door to find his father, whose face reveals complete and total shock that his son could possibly have discovered him! Hashem is Avinu Malkeinu. Before He is our King, He is our Father. And like a father, if you look to find Him, He’ll let you know He’s there. But, of course, you have to have a relationship with your Father first; otherwise, what possible motive would you have to look for Him? How often — if we look for them — can we see those hidden miracles? We answer that question three times a day in Modim: And for the miracles that are with us every day. “Every day” seems quite a challenging assertion. Did you or I see a miracle, big or small, today or yesterday? Perhaps we should ask ourselves another question: Did you or I do what the Jews in Shushan did all those millennia ago? Did we look to see one? 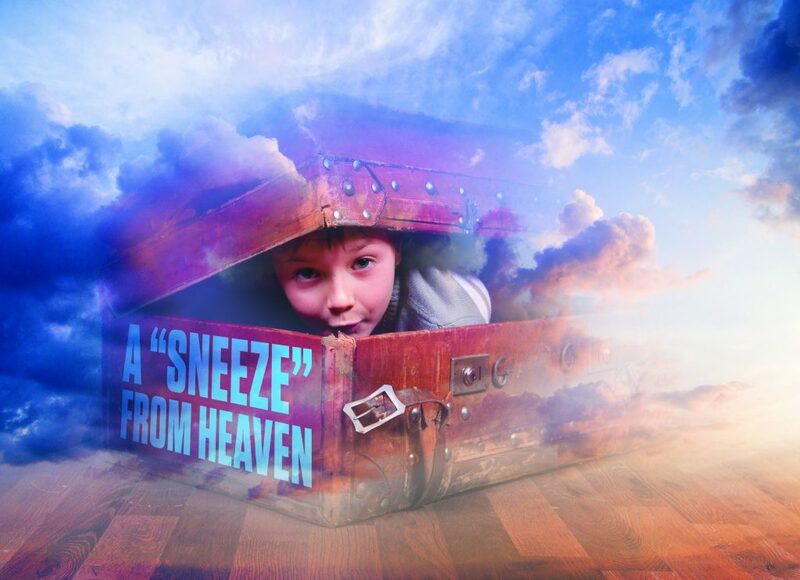 It’s only when we look that we will find; and even when there seems to be nothing there, that’s when the Sneeze comes! That leads me to a thought that the Ramchal writes at the beginning of his famous sefer, Mesillas Yesharim. The yetzer hara keeps us so busy that we don’t give any thought to the direction our lives are taking. He draws the analogy of a horse charging into battle, oblivious and blind to the danger towards which it is hurtling. Indeed, the yetzer hara keeps most of us so busy that we don’t have time to stop and notice that the Etzba Elokim might be leaving a fingerprint on us every single day. In a joint letter just before their passing, Rav Moshe Feinstein, zt”l, and Rav Yaakov Kamenetsky, zt”l, wrote that every person should keep a diary. If we are too busy with the present, perhaps looking back at the past, and at the stories we write about our own lives, we will notice the hidden miracles that are the basis of the entire Torah. I’m quite happy to echo his words: “I have seen too much to have any doubts.” And because I write a lot in both columns and books, I have a record to remind me of both the little Sneezes and the large ones. In my first book, I wrote about the time I was flying on a British Airways flight from Johannesburg to Durban on South Africa’s east coast. A few minutes into the flight, the captain informed us we had nothing to worry about, but then contradicted himself by adding that we might like to know we had lost our front wheels on takeoff. I recall thinking this was quite a lot to worry about, and an hour later, when we had a crash landing and no one was seriously hurt, I certainly considered that to be a “little” miracle. Then there was the time some 16 years ago when I was driving home late at night to Manchester with my daughter fast asleep in the passenger seat. There is something called hydroplaning. I had never heard of it before that car ride, but I quickly learned all about it. Hydroplaning occurs when a car’s wheels on one side are making contact with the road surface, and the wheels on the other are driving through water. When this happens, the car can spin out of control. My speed was the legal 70 miles per hour. My cellphone was turned off, as was the radio. I was in the middle lane, paying full attention to the road. But hydroplaning was precisely what happened. We demolished 120 yards of crash barriers (I know this because the insurance company had to pay to have it replaced) and came to a halt across the “fast lane” of the motorway. I turned on my hazard lights and opened my door, pulling my daughter behind me. I turned on my phone and called the police, but when I got through, they could not hear what I was saying. This was because when we came to a halt the car’s horn had jammed on and was creating too much noise for me to be heard. When the policeman on the phone told me to move away from the car so he could hear me, I obeyed. He still could not hear, so he told me to keep moving farther, four times in all, before he could finally understand our location and predicament. He assured me that a car was on the way. So was another one, at 80 miles per hour. This car crashed into my car and then spun across the road, landing on the hard shoulder. Fortunately, no one in the other car was hurt, but the impact with my car caused an explosion. A piece of the car flew through the air, hitting me in my right eye. Worse still, my car was now spinning towards us like a lawnmower’s blade. I grabbed my daughter’s hand with one hand and, holding my other hand over my eye (which I was sure I had lost), we started to run. My car eventually came to a halt and the police soon arrived and took us to the hospital. It turned out my eye was actually fine. It had been protected by my glasses, which had been torn off by the flying object. Apart from bruises, aches and pains, we were both all right. I couldn’t sleep that night and went downstairs to email a friend and tell him the tale. That’s when it struck me what a miracle I had just experienced. The car’s horn had jammed on. I don’t know why it did, or what the chances were that that should happen, but it saved our lives. Because of that horn, the policeman told me repeatedly to move away from the car. If not for that, we would have been standing beside the car when the other one plowed into it. But that’s not all. There was another “Sneeze” that resulted from this tale. My bruises, aches and pains kept me at home for two weeks. My old Rebbi, Rabbi Balkind, had become very ill and was in the hospital. Being stuck at home, I had not been able to visit him. I suddenly felt I had to go see him. Leaving my house for the first time since my accident, I started to drive. I was immediately overwhelmed by a feeling of tiredness and a suspicion that this was too much, too soon. Yet that feeling that I had to go and see my Rebbi returned, compelling me, so I drove on. When I arrived at the hospital, which I had never been to before, I managed to get lost no fewer than seven times before I found the correct ward. As I approached my Rebbi’s bed, a doctor and two nurses turned around and smiled at me. Rabbi Balkind’s son Aryeh had not left his side through the weeks he had been ill, but he had been forced to leave for an hour to take care of an urgent matter. Apart from the medical staff, Reb Balkind was quite alone. Suddenly they turned back toward their unconscious patient and their expressions became worried. They drew the curtain. A few moments later, the curtain opened and the doctor asked me if I was family. As a talmid, I felt I qualified and answered that I was. His eyelids flickered as I spoke the words I was sure he was saying in his head. A few deep breaths later and then a sigh, and his neshamah went home to Shamayim. I was and still am quite convinced that the insistent voice telling me to visit him that day was Rabbi Balkind’s voice. Getting lost seven times brought me to his bedside at precisely the moment he needed to say Shema. I have numerous such stories. I have put many of them in my books, which allows me to remember them. As the Ramban says, if you are expecting enormous miracles — like those during Yetzias Mitzrayim — you are wasting your time. But the little miracles, the hidden miracles — like those in the Purim story — are the basis of the entire Torah, and they occur everywhere and every day. As long as we are seeking Avinu Shebashamayim — who is, after all, only hiding — then like a father “sneezing” to let his child know he’s on the right track, He will let us know where He is.